This kit features a variety of prompts for memorable family fun. With this bucket list for family time, you’ll never find yourself asking "what should we do next?" Printed on a cute collection of birch wood sticks, the family fun-fostering prompts run the gamut from amateur astronomy (learn three constellations, then spend an evening stargazing) to encouragement to give back (volunteer as a family). Once you’ve shared each experience with your crew, note the date on the back of the stick with the official bucket list pencil (provided). Made in the USA. Instead of giving individual gifts to my friends and their children, I decided to give a family gift to each. They all loved it. I just wish the sticks and package were a bit bigger. As soon as my friend received the Family Fun Bucket List, she texted me with their first activity! They have had a blast looking forward to things to do each day. I gave this gift as the focal point of a holiday basket I created for each family at Christmas. I have 4 siblings, all of which have several children so you can imagine shopping for 20+ people every Christmas. I normally try to get something interactive for each family to do together. This gift was the perfect piece to my Holliday basket that I prepared along with cookies and chocolates :-) I know they will get great use out of it! I could have created it on my own. Very small! I would've liked bigger popsicle sticks for the price I paid. It's going to be a fun stocking stuffer! I got this for my brother's family for Christmas and they love it! I love this idea, so I got it for my nephew and his family. It arrived very quickly and well packaged. Admittedly, I didn't look at the measurements, so I was surprised at how small it was, so be sure to notice the measurements. Otherwise, a great little product. 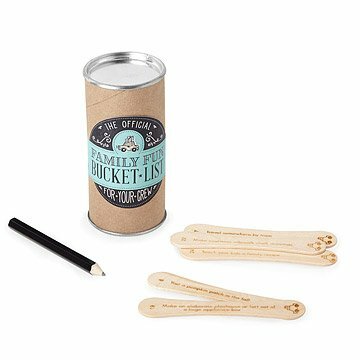 The product is a cardboard toilet roll/tin filled with Popsicle sticks with directions for family activities neatly printed on them. I read all of the activities at once upon receiving it, since it was going to be a gift to a friend. I don't remember them all, but I remember them being cute and charming. Some of the sticks would require a little planning ahead, so I wouldn't suggest expecting each thing to be spontaneous. This is a super cute gift for a young family, I was proud of the purchase and happy with the price, and the recipient was very excited, she could hardly wait to start planning the activities she and her family would do. dumbest thing i ever ordered! just wasn't what i expected. it was small. certainly not worth the money. could buy it in the dollar store-that's all it was worth!